Terry L. Ettinger Horticulture Consulting Services - Recommended Groundcovers for Central New York Landscapes and Gardens. When many people hear the word "groundcover," images of low-growing, spreading junipers, English ivy, pachysandra, or even a ground-hugging thyme, at right, might come to mind. Well, chances are that thyme will eventually be added to this list. However, I can tell you right now that several of the most common "groundcovers" in Central New York landscapes and gardens will never make my list of favorites. For example, English ivy (Hedera helix), though widely planted because it's practically impossible to kill, is an absolute weed. It will overwhelm practically anything - including a large maple tree in our backyard and our neighbor's home (photo at left)! 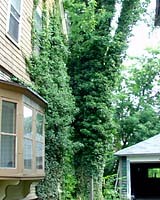 English ivy is so invasive that it's been listed as a noxious weed in an increasing number of states! Meanwhile, vinca/myrtle/periwinkle (Vinca minor) and Japanese pachysandra (Pachysandra terminalis) are just plain over-planted, boring, sometimes invasive and/or susceptible to several troublesome diseases and insect pests. 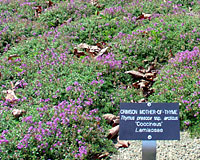 You might also be surprised to find that not all of my recommended "groundcovers" are low-growing? In fact, there will likely be some that can easily grow five to ten feet tall and wide over time. While plants this size won't fit in your rock garden, they'll be perfect for covering that steep slope that you're no longer willing to risk your life mowing!